"One of the best in the nation" "Eternal appeal" "Thrilling" "Spectacular, epic"
"...one of the best in the nation!" 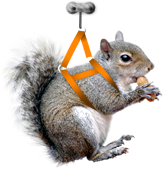 Our original, most loved, and nationally praised adventure! 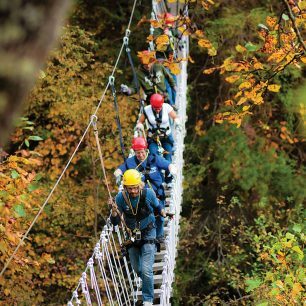 Zipline from tree-to-tree, cross sky bridges, and rappel to the forest floor on a one-of-a-kind journey through Moody Cove. An exhilarating mountaintop zipline adventure! Some of the longest, highest, and fastest ziplines in the world integrated into a truly spectacular wilderness setting. 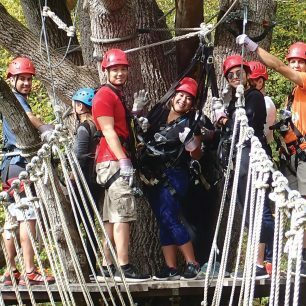 Our best value adventure package that includes BOTH of Navitat's thrilling zipline adventures in one action-packed, tree-lovin' day! Do it all and score great savings! Check out our NEW Guided RTV Excursions!